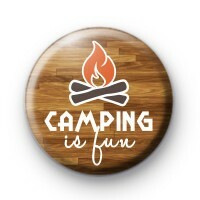 This 1 inch button badge is perfect for anyone that loves to explore, be outdoors and camp. It says Camping is fun on a wooden themed background. Do you enjoy sleeping under the stars and adventuring in the countryside? We have quite a few camping themed badges in the shop. These could be a fun keepsake for a family camping holiday.